National Association of Regional Media Centers. Although now independent, AECT continued to rent office space at the NEA headquarters until 1977, when it moved to another office building in Washington, DC. Unfortunately, time would prove that the "umbrella” concept would not play out altogether favorably. The division structure tended to fragment the membership into pieces of a pie without actually enlarging the pie. The national affiliates did generate convention attendees, which attracted commercial exhibitors, but did not otherwise contribute to AECT’s revenue stream. The audio cassette, introduced in the mid-1960s, effectively replaced reel-to-reel audio. In 1969 audio cassette sales were too small to measure, but by 1973 they represented 89 percent of all prerecorded audio materials being sold. In 1973 filmstrips with cassettes were the fastest growing media format in terms of commercial sales. Cassettes made it easy for individuals to tape their own audio material off-air or to produce and disseminate self- produced cassettes. It was a technological leap forward, but it also infringed on the dominion of the AV center’s production studio and their business of renting audio materials to schools. The videocassette player-recorder became a standard home appliance during the 1970s. Viewers could not only purchase inexpensive recordings of films and television programs, but they could make their own recordings off-air. Because of videocassette recorders’ inexpensiveness and ease of use, teachers quickly came to prefer them to the previous format—16mm film. Thus began a long, slow erosion of the educational film library business, another one of the mainstays of the audiovisual administrator’s dominion. As film libraries declined, so did sales of educational films, threatening the sustainability of the companies that produced and distributed them. Long-time exhibitors such as Encyclopedia Britannica Films, Coronet Films, McGraw-Hill Films, Julien Bryan’s International Film Foundation, and other such companies began to disappear from the exhibit halls at AECT conventions. For the first 50 years of its existence AECT predominantly represented professionals working at the elementary-secondary school level as administrators of audiovisual services, with college professors as the next largest group. In the mid-1970s the balance shifted toward higher education as audiovisual directors began to disappear as a separate job classification at the school building level. This came about partly due to technological advancement (pdf). Self-threading 16mm film projectors, carousel-type slide projectors, and synchronized cassette filmstrip players reduced the need for technical support and troubleshooting. Equipment became lighter, more portable, and more reliable. Less physical strength and expertise was required to transport and set up AV equipment. For film viewings, a teacher could push a video cassette into a VCR for viewing on a TV monitor instead of wrestling with a big screen and a bulky film projector. Similarly, a small audio cassette could be plugged into a small player instead of threading an open reel tape onto a heavy reel-to-reel tape deck. At the same time, automation was making school libraries less labor-intensive to manage. Even more important were economic factors. 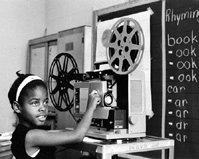 After the period of lavish federal support for educational media in the 1960s came a major national recession in the early 1970s that forced deep cuts in federal and state education funding. These budget cuts forced school administrators to make hard choices at the local level. As schools faced the choice of maintaining an audiovisual coordinator and/or a school librarian, they increasingly chose to keep the librarian (required for accreditation) and change the title to "school media center director.” Many school administrators focused just on the handling of equipment and materials, not on the consulting role played by AV directors as they worked with teachers in their classrooms to improve instruction. As a result, many school and district AV jobs were lost, shrinking the base of the association (pdf). As the functions of audiovisual coordinator and school librarian merged, so did many of the state associations that represented them. Many of the merged state associations retained affiliation to AECT, but allegiance of most members was to the American Association of School Librarians (AASL), so closer affiliation to AASL followed in due course. The allegiance of exhibitors also followed the money. 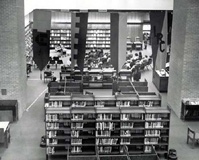 As school librarians, rather than AV coordinators, made purchasing decisions for AV materials, the advertising gravitated toward librarians’ periodicals and conventions. 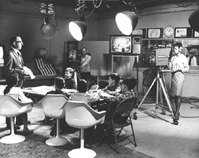 Because of the perceived overlaps and mutual interests of the two fields, representatives of AECT and AASL worked together for years to develop a single set of guidelines for school media programs, published first in 1969 and in a new version in 1975 (Media Programs: District and School). This was an important work, reinventing the school library as a "media center,” with a media program being supervised by a media specialist, who took on the new role of advising teachers on instructional design. The AECT-AASL partnership was revived for another revision of the professional standards (now "guidelines”) spurred by the advent of the computer age (Information Power: Guidelines for School Library Media Programs) in 1988. Now access to information became the key concept, but again the role of the school librarian was further expanded to encompass three roles: information specialist, teacher, and instructional consultant. These role changes, although probably inevitable, combined to undermine one of the job categories, the school AV director, which formed a core constituency of AECT. Robert Heinich, a professor at Indiana University and AECT president in 1971-72, had succeeded William Allen as editor of AVCR in 1970 and felt that it was time for the journal to receive a makeover, including its name. 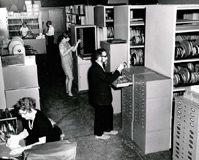 He realized that at the time of renaming the association there had been a sharp division of opinion among advocates for "audiovisual,” "communication,” and "technology,” so he decided to go along with the compromise that carried the day in 1970: communication + technology. So the journal became Educational Communication and Technology: A Journal of Theory, Research, and Development in 1978. Heinich continued as editor of "ECTJ” until succeeded by William Winn in 1983. Although Heinich and others had specifically included the word "development” in the subtitle to indicate their support of development work as a legitimate form of scholarship, a large sub-group of the members wanted a larger venue for scholarly work in the rapidly evolving area of instructional development, so they obtained the support of the board of directors to start a new journal, Journal of Instructional Development (JID) in 1978. JID’s editor was Kenneth Silber, a professor at Governors State University, who also served as president of the Division of Instructional Development at that time. In 1980 the venerable Audiovisual Instruction was recast as Instructional Innovator in an effort to reflect the larger agenda of the educational technology movement—beyond audiovisual media—and to appeal to a broader market of potential subscribers. Educational technology is a field involved in the facilitation of human learning through the systematic identification, development, organization and utilization of a full range of learning resources and through the management of these processes. Although this new definition met with little opposition, there was a widespread feeling that this was only a transitional definition—that the field was still evolving in ways that required continuing effort to understand and articulate. AECT’s definitional efforts were stimulated by a grant from the National Center for Educational Statistics (NCES) to develop a handbook of terminology to be used to standardize terms in future data-gathering activities of the federal government. a complex, integrated process, involving people, procedures, ideas, devices and organization, for analyzing problems and devising, implementing, evaluating and managing solutions to those problems, involved in all aspects of human learning. The writers insisted that a complete definitional statement required acceptance of not only this single sentence but also of the concepts underlying each term—encompassing the whole book. Another major feature of the overall definition was that instructional technology was a subset of educational technology, as instruction is a subset of education. Instructional technology is the label to be used in situations in which "learning is purposive and controlled.” In general, though, the definition, accepted as official by the AECT Board of Directors, now centered on a problem-solving process, rather than on audiovisual materials. The publication program of AECT continued to grow through the 1970s and 1980s, maintaining the two journals, adding JID, and publishing an expanding list of books and monographs. Several staff members were employed to supervise the production and sales of AECT’s growing list of periodic and non-periodic publications. Since most non-periodic publications never recovered their cost of development and production, this tended to be an expensive function to support. During this period, the annual convention (pdf) comprised the largest portion of the association’s income, with the commercial trade show contributing approximately a quarter of the total annual revenues. Thus, although most of the association’s activities were now conducted by members and national staff daily outside the convention venue, the convention still remained the focus of AECT’s economics, justifying a full-time convention coordinator and staff assistants. Modifications were made to keep the convention relevant to the needs of both members and exhibitors, and organizers went to great pains to try to satisfy these sometimes competing constituencies. The number of exhibitors gradually declined between 1970 and 1980, due to a number of factors, including a national economic recession, a decline in buying of traditional products such as educational films and audiovisual projection devices, and the changing demographics of the association—fewer school AV administrators with dollars to spend and more professors coming to the convention to exchange ideas, not dollars. A side effect of the changing demographics was a general decline in convention attendance. Members with administrative duties, such as school district AV directors, had budgets that included funds for travel. This was easily justified since they were responsible for procuring new equipment and AV materials, and the convention was where these things were exhibited and orders placed. As the numbers of AV administrators shrank, a greater proportion of the attendees funded their travel out of academic budgets. To justify a trip academically, the member had to demonstrate the scholarly rationale of the trip, preferably by presenting a paper at the convention. Thus, in order to attract registrants, the convention planners had to make lots of spaces for individual papers. This created a growing profusion and dilution of quality of concurrent sessions, leading to impressions such as "I went to a half dozen presentations, but they were all pathetic;” or "I gave my presentation but only five people were in the audience.” One of the strengths of the convention in the earlier days had been its coherence. There were relatively few educational sessions, so the speakers were carefully chosen and the sessions heavily attended. Attendees experienced much more of a common experience. As the convention experience became more diffuse it became less satisfying, so fewer people came. 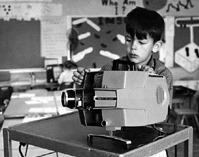 Another sort of change—the changing national culture of the 1970s—was eventually reflected in the AECT convention, for example, with the initiation in 1976 of a Student Media Festival (student-made 8mm films) and a Multi-Image Festival (multiple slide projectors and sometimes multiple screens used to display "mind-blowing” presentations) and in 1977 of Evening Flicks (short non-commercial, sometimes "counter-cultural” films). These events were now populated by folks with wide paisley ties, patterned and colored shirts, and bell-bottomed pants. 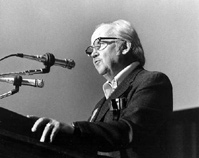 1981-1982, Rolland Billings, director, Media Services, Ann Arbor MI public schools. At the beginning of the 1980s AECT had an ambitious agenda and significant accomplishments but was struggling with a rather large overhead, declining membership (from 11,000 in 1970 to 5,600 in 1980), and declining attendance at and revenue from the convention. Indeed, the burden of deficit spending had put the future of the association in doubt. In 1982 the board of directors, chaired by Elwood E. "Woody” Miller, made a number of hard decisions. The first was to not renew the contract of eleven-year executive director Howard Hitchens, placing Charles Van Horn, the deputy executive director, in the position of acting association manager while AECT searched for a new executive director. Another major decision was to change directions on the annual convention. Instead of the planned spring meeting in Louisville, AECT would join the National Audiovisual Association (NAVA) at its January 1983 convention in New Orleans, sharing NAVA’s trade show, COMMTEX International. Next, the board decided to reduce the size of the headquarters staff. Admittedly, this move would lead to a reduction in member services, but was vital for the cash flow problem. The downsizing included reducing the board of directors from 17 to 11 people. Another feature of the board’s recovery plan was a determination to make better use of electronic technologies in the management of the association itself. With these and other changes under way, AECT entered 1983 with some trepidation and with the hopes that a leaner and more focused organization could prosper in the coming information age.